With its location at the nexus of several bird migratory routes, New York City is a natural stop for birds heading south in the fall and north in the spring. To take advantage, Bryant Park offers free birding tours during both these seasons. While New York City’s parks offer inviting havens for birds needing a rest, other aspects of the city aren’t so good for their health. Tall buildings, clad in reflective glass, pose a real threat and cause thousands of bird deaths annually. NYC Audubon’s Project Safe Flight program aims to track and alleviate this problem. Last year, we told you about Lights Out NY, when owners and managers of tall buildings were urged to turn off unnecessary lights at night, and office workers were asked to draw blinds or use area lighting when working at night. 34th Street Partnership spread the word to its constituents, and Vornado Realty Trust, which has 11 properties in the district, led the way. Kenrick Carvan, a member of the Bryant Park sanitation crew, poses with a representative from NYC Adubon as he accepts a certificate recognizing his contribution to Project Safe Flight. Bryant Park is also involved in this effort. A recent newsletter from NYC Audubon explained how the park’s sanitation team contributes through data collection. 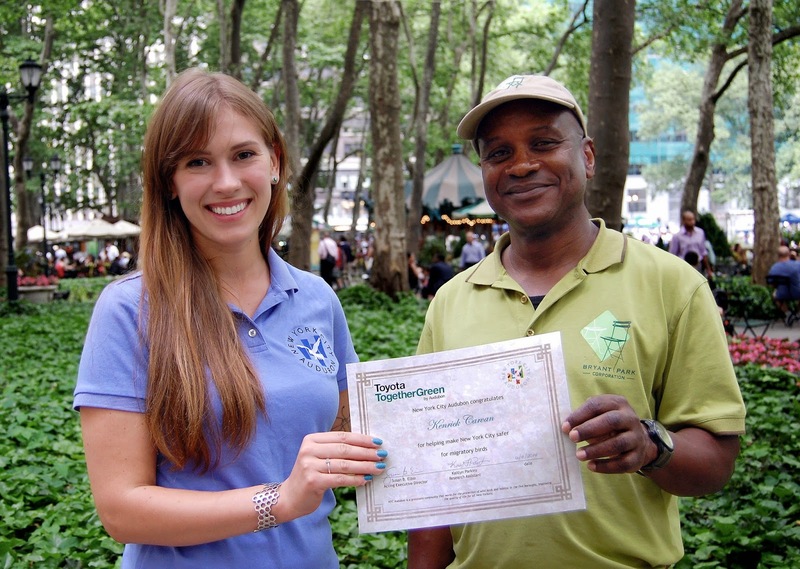 Bryant Park staffer Kenrick Carvan found a dead hermit thrush which showed signs of having crashed into a window. He took a photograph of the bird and sent it to NYC Audubon, along with all the details, and the organization entered the information into a database that extends 15 years back. This is an excerpt from Bryant Park's weekly newsletter, MidCity News, written by Terry Benoit.MidCity News keeps park enthusiasts informed about our events, milestones, operations, and all of the detailed maintenance work that goes into caring for the park. Weekly updates are sent with our sister organization 34th Street Partnership.